Spottiswoode Residences: Thorn amongst the roses or other way around? 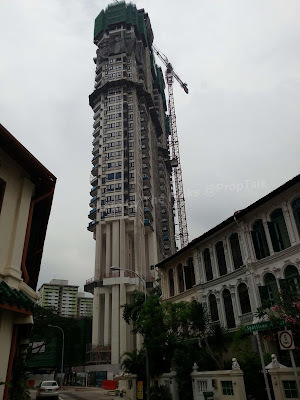 The wife and I were passing through Spottiswoode Park Road and took this photo of the "under construction" Spottiswoode Residences. The 36-storey apartment block does look a tad outta place alongside the rows of pre-war terrace houses that lined Spottiswoode Park Road. Then again, one cannot stands in the way of progress, no? No Comment to " Spottiswoode Residences: Thorn amongst the roses or other way around? "